Hurricane Irma has become the most powerful hurricane on record in the Atlantic Ocean outside the Caribbean or the Gulf of Mexico. The storm is a strong Category 5 hurricane on the Saffir-Simpson wind scale, with sustained winds up to 185 mph, according to the National Hurricane Center. Florida Keys Emergency management officials have issued a mandatory evacuation to begin Wednesday at 7 a.m. for visitors and 7 p.m. for residents. A state of local emergency went into effect for the Keys Tuesday afternoon. There will not be any open shelters in Monroe County. Gov. Rick Scott has also directed the Florida Department of Transportation to suspend tolls statewide in preparation for Irma as the storm moves westward. 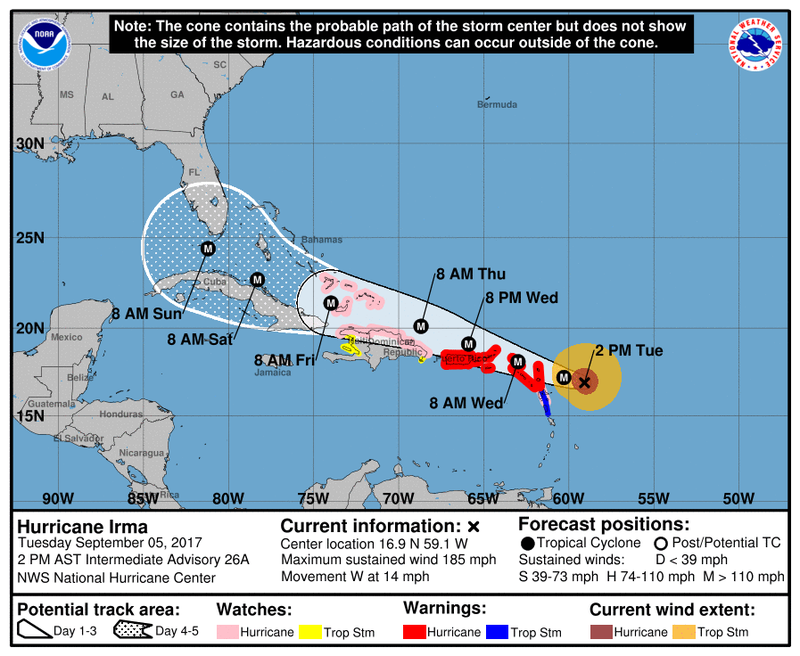 Irma is expected to cross over the northeastern Leeward Islands Wednesday morning, then move parallel to the northern shores of the Greater Antilles islands of Puerto Rico, Hispaniola and Cuba Thursday through Saturday. 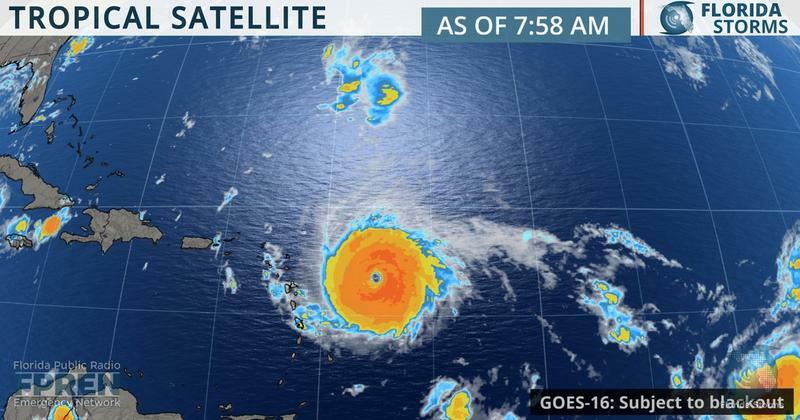 Hurricane Warnings have been issued for the U.S. and British Virgin Islands and Puerto Rico, along with the Caribbean islands of Antigua, Barbuda, Anguilla, Montserrat, St. Kitts and Nevis, Saint Maarten and Saint Barthelemy. A Hurricane Watch is in effect for the Turks and Caicos Islands, parts of Haiti and the Dominican Republic and Southeastern Bahamas. During the next 24 hours, Irma is expected to maintain a general westward track before turning west-northwest, but experts warn that forecasts become less accurate beyond 3 day models. "In the last model run there has been a shift to the west," said meteorologist Cyndee O'Quinn. "The National Hurricane Center has aligned its forecast to the general consensus of the models with a more westwardly track. The confidence in the forecast past 3 days is low as the models have widespread solutions for forecasts beyond 72 hours." O'Quinn and the National Hurricane Center urged all Floridians to start making plans and stocking up on supplies, as there is an increased chance in the Florida Peninsula and the Florida Keys of seeing impacts from Irma later this week and weekend. Miami-Dade County Mayor Carlos Gimenez announced on Tuesday the county could begin evacuations for Zones A and B ahead of Hurricane Irma as early as Wednesday. He said shelters will be available, but they should only be seen as "a last resort." The Florida Public Radio Emergency Network contributed to this report.